There’s an old axiom that says patience is a virtue. Just ask Arizona Coyotes’ coach Dave Tippett. Here’s a man recognized as one of the better coaches in the NHL and a man who has endured losing season after losing season. If there is a benchmark for patience, Tippett probably drew the geometric form and wrote the definition. Now at the conclusion of another “rebuilding season,” Tippett could, mercifully, be on the edge of a quantitative reward. Dealing veterans center Martin Hanzal and defenseman Michael Stone near the trading deadline, Tippett, along with general manager John Chayka, now have a stock-pile of draft selections. That goes along with a plethora of younger players centered around Dylan Strome, Jakob Chychrun, Max Domi, Brenden Perlini, Clayton Keller, Christian Dvorak and Christian Fischer. While the key word, again, going forward is “patience,” the combination of this young talent and Tippett’s ability to get the most of what he has could portend hope for the future. 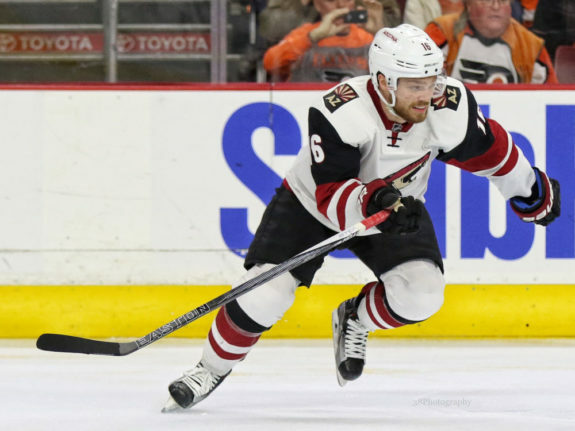 For now, the Coyotes limp unceremoniously to the NHL finish line and this season, they hope, is just another blip on the club’s radar history screen. While the role of spoiler in the remaining games bears a horrid sting, the Coyotes did not come out with any punch Wednesday night and fell to the St. Louis Blues, 3-1 before 11,377 at the Gila River Arena. The loss was the Coyotes’ sixth in their past seven games and fourth in a row. To that end, Tippett reminded listeners afterward that the Blues generally gave his young players a message they should heed. Stick that in your collective notebook and refer from time to time, seemed to be the message. Despite continued maladies, Tippett is doing his best to forge a future. One element was displayed on the power play. When the Blues’ Nail Yakupov was sent off for tripping mid-way through the second period, Tippett went with his players of the future. To start this power play opportunity, Tippett put out Alexander Burmistrov between Domi and Perlini. On the next shift, Keller centered between Dvoark and veteran Radim Vrbata. That included four players 22-years-old or younger. Plus, Tippett had 18-years-old Chychurn and 21-year-old Anthony DeAngelo handling the points. Ditto for the next power play opportunity. After the Blues’ Colton Parayko was whistled for roughing early in the final period, Tippett put out the same two lines, and paired Chychrun and DeAngelo again, which skated during the second period power play attempt. Things finally clicked on the third effort. With the Blues’ Magus Paajarvi off for high-striking late in the final period, both Dvoarak and Keller set up Alex Goligoski from the left side for Goligoski’s sixth of the season on the power play and the Coyotes’ only goal on the night. In forging ahead, Tippett has used nine rookies at any one time this season in his line-up. 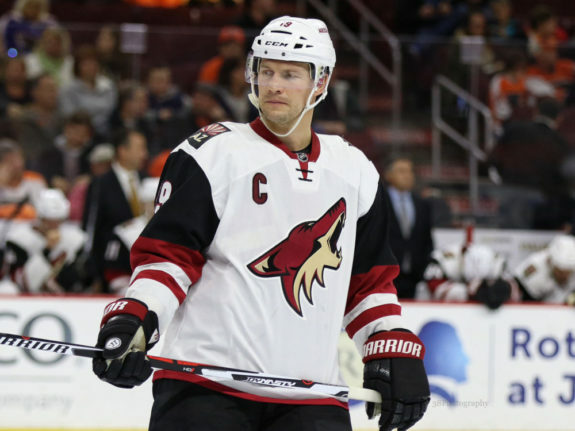 Captain Shane Doan sat out his straight seventh game, but is expected to play this Friday night at home against the Washington Capitals. Down with a groin injury, Doan will play out the remaining five games and then think about his future. Elsewhere … Patrik Berglund of the Blues scored mid-way through the opening period, and that represented his 150th career NHL goal. Berglund, the Blues’ first round pick in 2006 (25th overall), reached another milestone on Jan. 17 against Ottawa. That’s when he skated in his 600th NHL game.